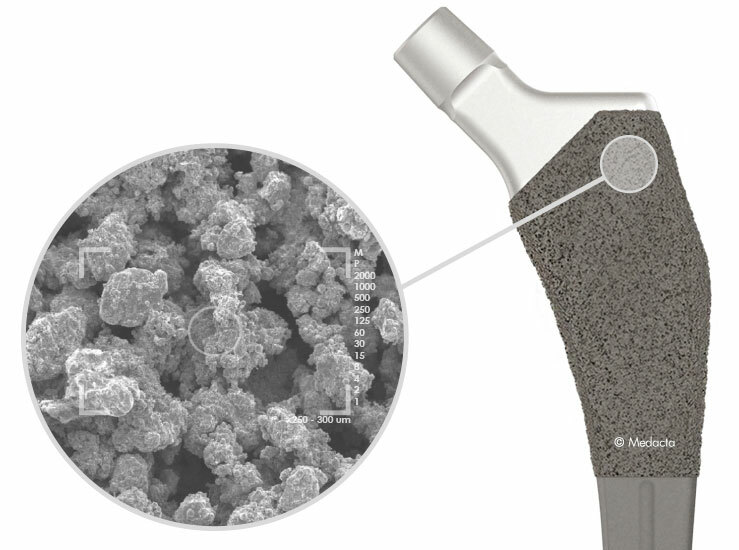 The MasterLoc Hip System follows this philosophy, presenting a novel proximal coating - Mectagrip, designed for initial stability and long term fixation. With an optimized design, the MasterLoc Hip System is suitable for all MIS procedures, especially the AMIS approach. 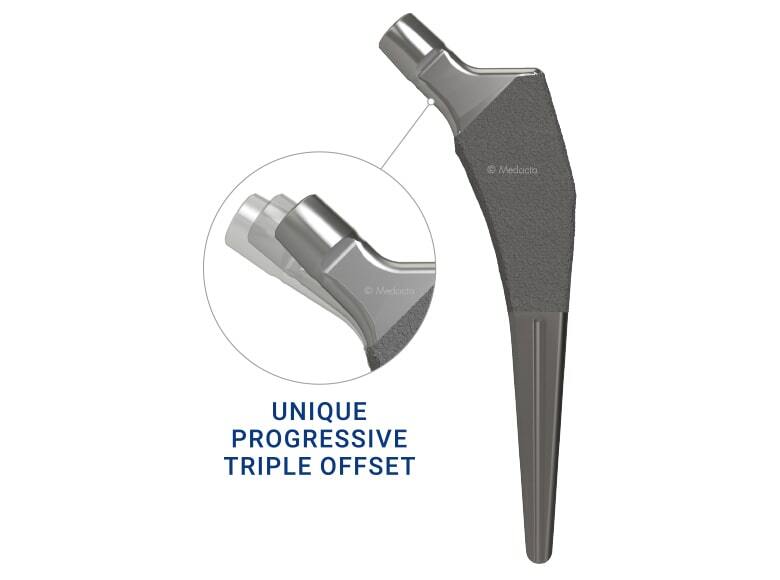 The MasterLoc Hip System offers a unique progressive triple offset, which allows for an easier and more effective management of the patient’s femoral offset, completely independent from the leg length. This MasterLoc Hip System distinctive offer helps achieving good restoration of the hip joint biomechanics in nearly all patient populations. A coating treatment consisting of a layer of commercially pure titanium, deposited through Vacuum Plasma Spray technique (VPS). This method offers a high friction coefficient for enhanced initial stability, and the potential for long term fixation[5,6,7,8] thanks to a carefully chosen porosity: open pores with pore dimensions between 100-350μm, and a continuous interconnectivity. The MasterLoc Hip System is designed to accommodate all MIS techniques. The instruments and implants have been specifically designed to reduce the risk of damaging soft tissues when utilizing MIS procedures, in particular the AMIS approach. This design philosophy seeks to allow the implant to self-seat within the femoral canal, achieving enhanced mediolateral stability. Applying modern advancements to promote bone preservation, the MasterLoc Hip System features a reduced distal geometry and stem length. These features have been introduced to enhance implant fit in the metaphysis while also enhancing performance in Dorr type A, B and C femoral canals. These advances may help prevent unexpected distal fixation and other fit issues demonstrated by early flat, tapered wedge hip systems. The lateralized version adds 6 mm of femoral offset and the lateralized plus version adds an additional 5 mm, for 11 mm in total offset, always maintaining the same leg length. The MasterLoc Hip System is manufactured from an industry standard titanium alloy (Ti-6Al-7Nb, in accordance with ISO 5832-11). This material has been shown to have great flexibility and to be highly biocompatible. One of the key features of the MasterLoc Hip System is the introduction of Medacta’s Mectagrip coating. The design concepts of the MasterLoc Hip System adhere to the original design presented by M. E. Müller. The stem utilizes a 3-degree taper in the A/P plane, to enhance metaphyseal fixation from the medial aspect of the femur to the lateral aspect of the femoral canal. The transition from the metaphyseal filling region to the smaller diaphyseal region maximizes fixation proximally, reducing the potential of distal fixation. Wolff’s Law states that bone density will increase under load. Therefore, the stem was designed to enhance proximal load transfer and maintain a good trophic bone in the metaphyseal region. Studies reported a non negligible incidence of thigh pain related to the first generation of tapered wedge design stems. 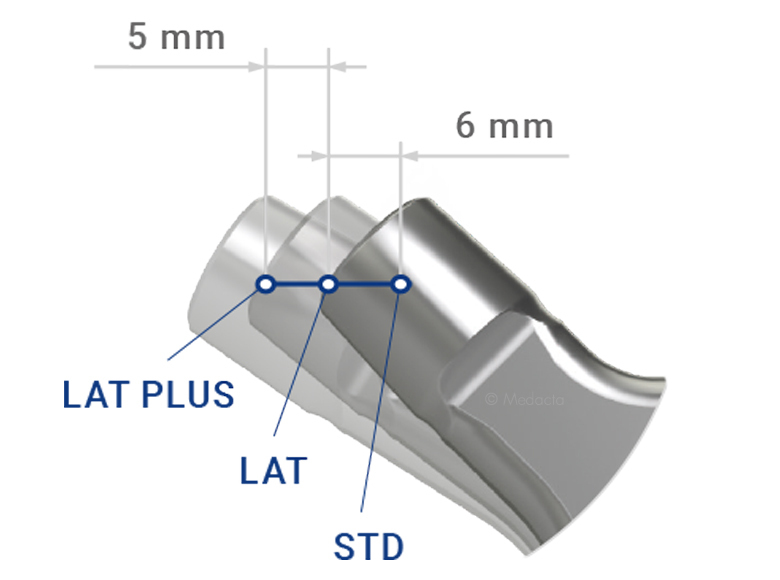 This was attributed to an unexpected distal fixation observed in some patients’ anatomies (mainly Dorr type A femurs), and it was addressed by the second generation of tapered wedge design stems by reducing the distal shape. 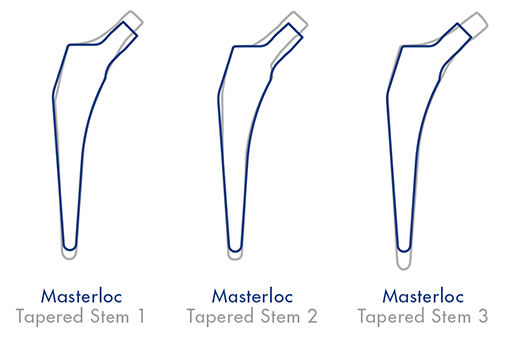 The MasterLoc Hip System features a reduced distal geometry, which will enhance the metaphyseal proximal fill, and also make it suitable for Dorr type A femurs, while at the same time allowing for bone preservation. suitable for double mobility liners. Additionally, the reduced A/P geometry may increase the range of motion. Instruments for calcar preparation included on the ancillary. The anterior approach, strengthened by years of clinical experience, is the only technique which follows a path both intermuscular and internervous and therefore lowers the risk of damaging periarticular structures such as muscles, tendons, vessels and nerves. 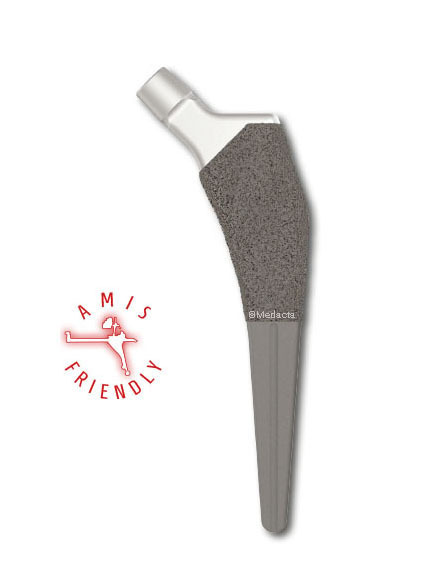 The AMIS approach, developed in 2004 by an international group of expert surgeons with the support of Medacta, was born to optimize and enhance the reproducibility of the anterior approach, minimizing soft tissue damage. With more than 10 years of clinical experience, Medacta International became the world leader for educating and supporting surgeons in their pursuit of Anterior Minimally Invasive Surgery (AMIS). Reference Centers, located throughout the world, provide the necessary AMIS educational experience and Medacta offers continuous support for surgeons, as well as constantly improving and developing the industry’s most specialized instrumentation platform. 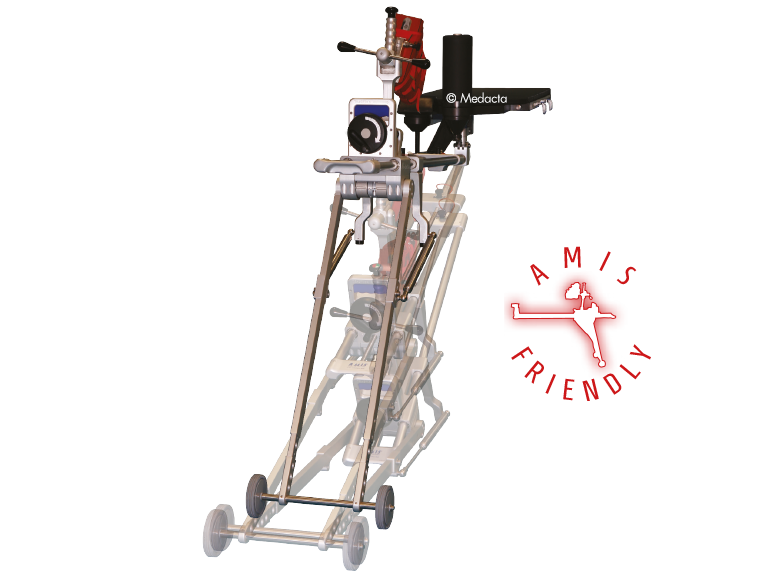 Using the MasterLoc Hip System lets you enter Medacta International’s world of AMIS. The AMIS Mobile Leg Positioner will be supplied as part of the instrumentation to help ensure effective and reliable positioning of the leg during surgery. Traction, adduction and hyperextension have never been so easy. Healy W, Tilzey J, Lorio R, Specht L, Sharma S. Prospective, Randomized Comparison of Cobalt-Chrome and Titanium Trilock Femoral Stems. J Arthroplasty. 2009;24:831-6. Parvizi J, Keisu K, Hozack W, Sharkey P, Rothman R. Primary total hip arthroplasty with an uncemented femoral component: a long-term study of the Taperloc stem. J Arthroplasty. 2004 Feb;19(2):151-6. 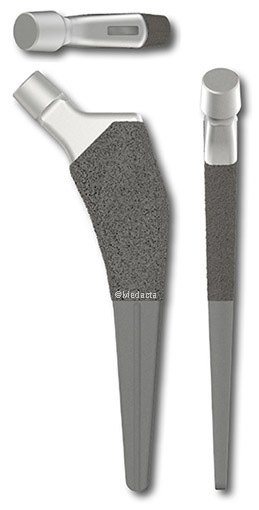 McLaughlin J, Lee K. Total hip arthroplasty with an uncemented tapered femoral component. J Bone Joint Surg Am. 2008 Jun;90(6):1290-6. P. Robotti, A. Sabbioni, L. Glass, B. George, Macroporous Titanium Coatings , by Thermal Plasma Spray, ITSC 2013, International Thermal Spray Conference, May 13 –15, 2013,Busan, Korea. J. E. Biemond et al, In vivo Assessment of Bone Ingrowth Potential of 3-Dimensional E-Beam Produced Implant Surfaces and the Effect of Additional Treatments by Acid-Etching and Hydroxyapatite Coating, J. Biomat. Appl, published on line January 27, 2011, 0885328210391495. McLaughlin JR, Lee KR. 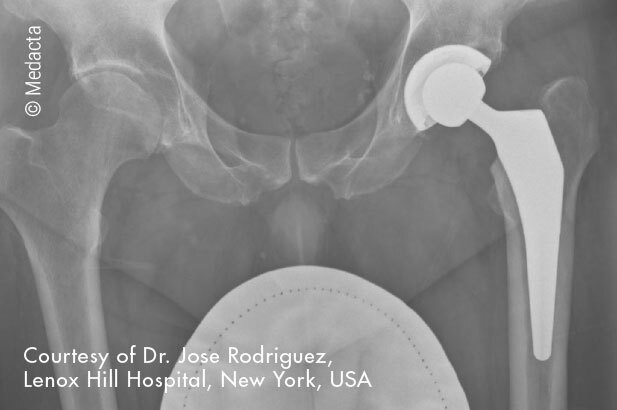 Cementless total hip replacement using second-generation components: a 12- to 16-year follow-up. J Bone Joint Surg Br. 2010 Dec;92(12):1636-41. Khan W, Muntimadugu E, Jaffe M, Domb AJ (2014). Implantable Medical Devices In W Khan and AJ Domb, Focal Controlled Drug Delivery (p. 33-59). Springer New York Heidelberg Dordrecht London. Wolff J. Das Gesetz der Transformation der Knochen. A Hirschwald, Berlin, 1982.
 Cooper H, Jacob A, Rodriguez J. Distal Fixation of Proximally Coated Tapered Stems May Predispose to a Failure of Osteointgration. J Arthroplasty. 2011;26:78-83.